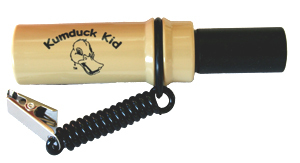 Designed specifically for young callers, the Kumduck Kid features our new notched-tip reed. The Natural has a short barrel and comes with the notched-tip (#2) reed. The beauty of Oregon's Tan Oak combined with the promise to never lose another stem. The beauty of Pacific Madrone Burl combined with the promise to never lose another stem. The beauty of maple burl is enhanced by the weatherproof clear epoxy. 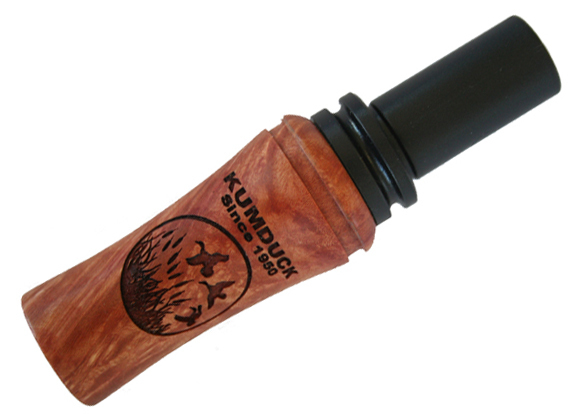 Double the action with this combo - KumDuck Legend and Sauvie Island Wigeon Whistle. 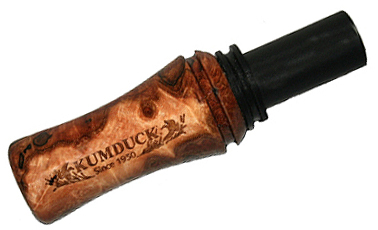 The KumDuck Legend is a classic. This synthetic black call has been a favorite since 1950. Updated in 2005, the single reed is hand-sanded. 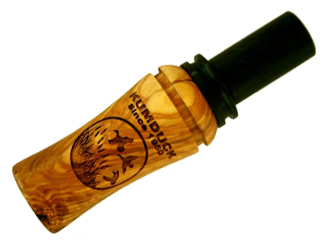 This call blends the romance of duck hunting using a vintage 1950's call with 21st century serrated, Dichroic*-coated reeds. Clear acrylic body. This classic call is a tribute to the original inventor, Gordon Halsten. From highs to lows, soft to loud and inviting feed chuckles, the sanded surface produces clear, sharp sounds. Click for more information on each of the reeds, replacement stem and replacement cork.